Slowly bring to a boil, stirring frequently. Insert a candy thermometer into syrup and continue cooking until temperature reaches 300 degrees F. Remove from heat. Stir in gelatin until smooth. 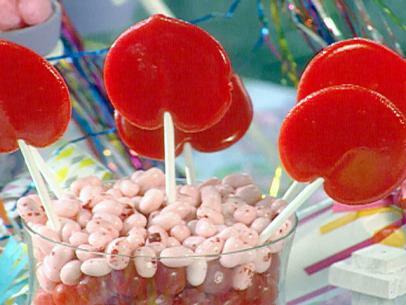 Using a metal tablespoon and working quickly, drop heaping spoonfuls of lollipop syrup on end of each lollipop stick. Cool completely. Wrap each sucker in plastic wrap and store in an airtight container. When measuring corn syrup, spray measuring cup with nonstick spray as corn syrup will pour out smoother. This sugar syrup is very hot and can cause a painful burn!